Recommended to: Readers who enjoy mysteries with a slow burn, and noir style writing. 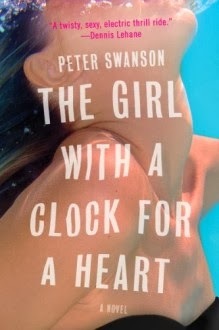 Peter Swanson's The Girl With A Clock For A Heart threw me for a loop. I'll admit that I went into this book completely blind. This was a total case of succumbing to cover love when I was offered this for review. That being said, I was pleasantly surprised by this book. It's got a bit of Hitchcock feel to it, and it's a nice easy read. George Foss is just an everyday kind of man. He's reached a point in his life where things have stalled. A mid-life crisis if you will. Which is why when a girl from his past, a girl he thought was gone for good, steps back into his life? He takes a chance. I liked George. He didn't always make the best decisions, his fascination with this girl wasn't always easy to understand, but underneath it all he was a good enough guy. The thing about The Girl With A Clock For A Heart is that the whole plot hinges on the girl from George's past. If you can't believe in their connection, you can't really understand why he makes the decisions he does. I found this part to be a little weak. We see flashbacks to George's history with the girl, from a short time during his college career. Can you really build that strong of a relationship with someone in that short of a time? Enough that you'd agree to put yourself in danger for them when they show up out the blue, years later? I just don't know. If you let all that go though, and just travel with the flow of the book, it's not a bad read. The mystery George finds himself wrapped up in is beautifully designed. I didn't see most of it coming. Even the ending, which wasn't entirely unexpected, was a surprise. I'm a little upset about the fact that it was so open-ended, but then again that's just me. I like resolution. The Girl With A Clock For A Heart gets three stars from this bookworm.